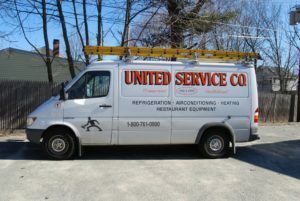 Come to United Service Co. for the most reliable water chiller service Danvers has to offer. We know how to achieve high-volume cooling at maximum efficiency in the commercial setting, and we can help you optimize your unit. We believe in proactive preventative maintenance, skilled professional repairs, and expert installations to give water chillers their best chance at success. Whether one small component in your water chiller needs repair or you need to replace your entire system, we can deliver. Call us today to schedule services! What’s Wrong with Your Water Chiller Service in Danvers? Component corrosion. Over time (and with lack of maintenance), copper chiller tubes can start to corrode. This can affect the performance of your water chiller due to sediment buildup and poor water flow. Prevent refrigerant loss and other negative outcomes; call in a technician to repair corrosion as soon as you notice this type of wear and tear. The chiller won’t run. If the chiller won’t turn on, you may need electrical water chiller service. Danvers business owners should never attempt these repairs alone, as chillers involve dangerous high-voltage circuits. A wire may need replacement, or you may have an open condition on the control circuit that’s preventing power. Low pressure, broken modules, and several other things could cause this problem. Low refrigerant. Your water chiller could start leaking small amounts of refrigerant over time. This is normal over many years of service, but it isn’t necessarily something you have to live with. A technician can detect refrigerant leaks and make repairs or replacements to stop the leak and help you conserve refrigerant. Maintenance-related breakdowns. Sometimes all a chiller needs is preventative maintenance. Lack of maintenance can lead to serious energy waste – chillers are the largest energy-using appliance in most industrial and commercial buildings. If you notice an increase in your utility costs or a system that works ineffectively, sign up for maintenance water chiller service in Danvers. Mineral buildup. It’s common for any component dealing with water to eventually experience sediment buildup. If you have poor water quality, you might notice greater mineral buildups than normal. Routine maintenance can help control sediment levels and prevent them from escalating to the point of harming the system. Poor performance. You may need water chiller service in Danvers if your unit is running but can’t hit the temperature you set at the thermostat. This could mean your evaporator is frozen or the system load is too much for your unit to handle. An overworked chiller can lead to major energy costs. You may need repairs. Any number of things can go wrong with a system as complex as your commercial water chiller. Luckily, maintenance with the right company can help you stay in control of your chiller’s performance. United Service Co. has more than a century of combined experience handling water chillers and other commercial heating and cooling components. We understand how chillers work, what they need to operate efficiently, and how to keep costs low. No matter what’s wrong with your system, we have the water chiller service in Danvers you need. Clean, courteous technicians. View our testimonials – you’ll see our customers rave about our friendly, caring, and knowledgeable technicians. Customers have called us “great to work with,” “fast, professional, and courteous,” and “always responsive and professional.” We take pride in hiring the most competent crew possible. No-nonsense services. Our family owned business is not here to take advantage of business owners who aren’t experts in HVAC. Instead, we built our brand on honesty and integrity. We only recommend water chiller service in Danvers we truly believe you need for an optimized system, and we will always give you price estimates up front. Years of experience. At United Service Co., our field knowledge doesn’t just come from books – we have more than 100 years of experience under our belts! Nothing equips a team quite like hands-on experience in real-world scenarios. We can troubleshoot and solve any water chiller problem. Same-day repairs. United Service Co. is all about customer convenience. We strive to complete most repairs same day, keeping our fleet vans fully stocked with high-quality parts and materials. We also provide 24/7 emergency services to our loyal customers throughout New England. Excellent price vs. value. You won’t find our prices for the same level of value anywhere in the area. When it comes to affordable, competitively priced water chiller service, Danvers business owners count on us. We’re worth every cent! United Service Co. is your partner in all things commercial refrigeration, heating, and cooling. We want to be your first choice when it comes to professional HVAC services. After just one service with us, you’ll know you’ve found a solution for life. To inquire about water chiller service, Danvers residents can call (800) 761-0900 or reach out online.